I would go so far as to assert that my quest for the perfect cookie is not incomparable to those taken by Odysseus or King Arthur (although admittedly far more gluttonous). This may seem a big claim to make, but I have spent years trying to find and make the perfect cookie, and still do not feel entirely satisfied with the results. Why? 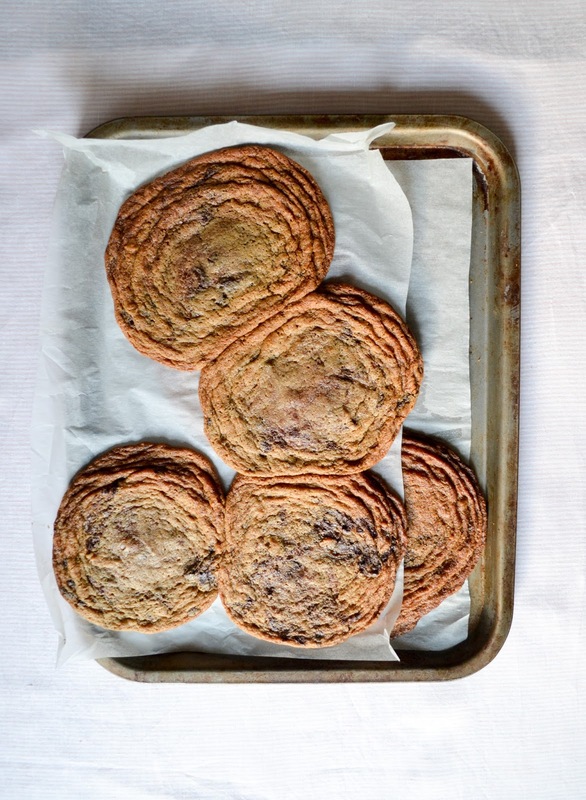 Because the perfect cookie should be soft but also crispy. It should melt in the mouth but have enough chew and texture too. It should be buttery and delicious yet not spongy. It should look wrinkled and sunken and decadent without being unbaked and stodgy. And then there's the flavouring and fillings - a list for another time perhaps. This batch totally won out on the sunken wrinkle factor. 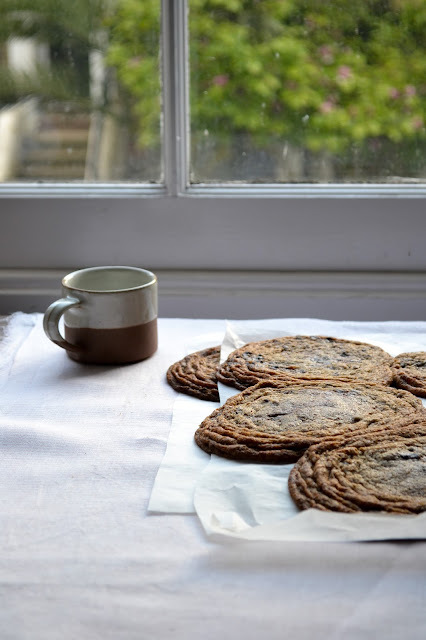 I used my very favourite almond butter by Pip & Nut to replace part of the flour, which gives these cookies a delicious nutty flavour and sticky texture too. I love using ganache chips in place of regular chocolate; they melt into the dough and is totally worth the extra effort. For the ganache chips, finely chop the chocolate and place in a heatproof bowl. Warm the cream to scalding point, then pour over the chocolate. Leave it to sit for 5 minutes, then stir just until the chocolate is melted and the ganache is smooth and shiny. Line a tray with clingfilm, then spread the ganache over the top. Place in the fridge and allow to set. Once the ganache is set, heat the oven to 180°C and line two baking trays with paper. Place the softened butter and the sugars in the bowl of a stand mixer. Beat until pale and fluffy, then add the egg and the vanilla extract and beat until completely incorporated. In a separate bowl, whisk together the flour, bicarbonate of soda and salt. Add to the wet ingredients and mix until just combined. Add the almond butter and mix through. Roughly chop the set ganache into pieces, then add to the cookie dough and gently combine by hand using a metal spoon. Use two teaspoons to spoon the cookies onto the trays. 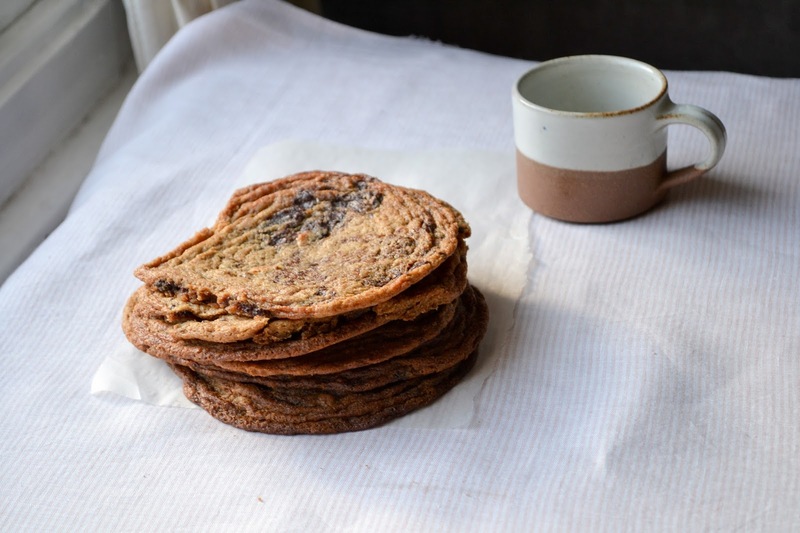 Each cookie should have about 2 large tsps of dough. Use a pallet knife to flatten the cookies a little, then sprinkle with flakey sea salt. They will spread in the oven so just place 3 to 4 cookies on each tray. Bake in the oven for 9-11 minutes, until the cookies have spread, risen and sunk again, and are just golden around the edges. Remove from the oven and leave to cool on the tray for 10 minutes, before removing to a wire rack to firm up fully. 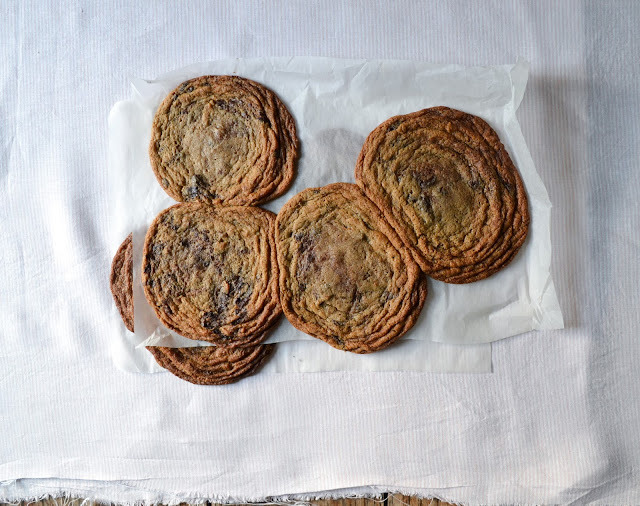 Repeat this process until all the dough has been used up - yo can reuse the baking parchment, and should get around 30 cookies from the dough. This post was written in affiliation with Pip & Nut, but all views are - as always - entirely my own. I am here new to visit this blog site. I don't know it is the right place for my post. I am here, for asking an essay writing help. I need someone’s help for completing a essay paper. I have to prepare a good essay paper and to score high marks in my academic works. Please help me for my work. I heard about the essay writing services, they give a lot of information about writing an essay papers and also other academic works. I don't know more about the custom essay writing service . Please share your opinions about the essay writing service.